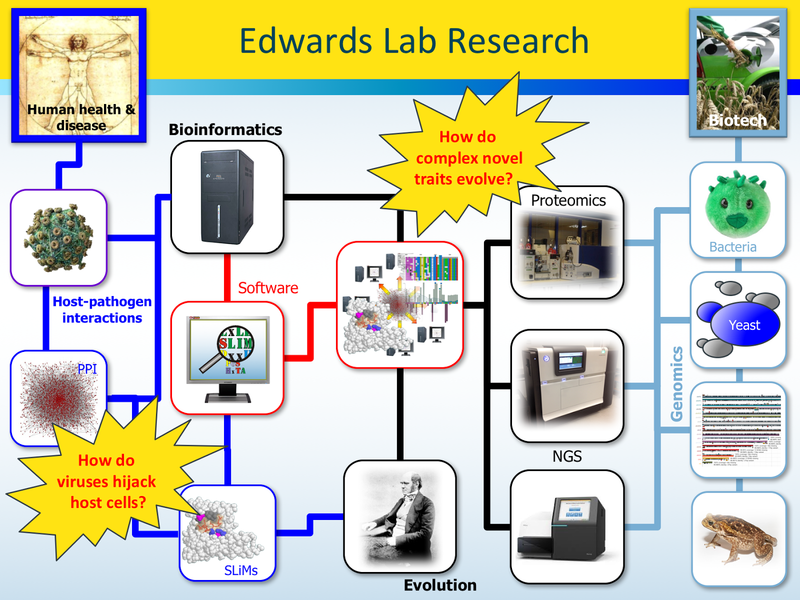 Research interests in the Edwards lab stem from a fascination with the molecular basis of evolutionary change and how we can harness the genetic sequence patterns left behind to make useful predictions about contemporary biological systems. We are a bioinformatics lab but like to incorporate bench data through collaboration wherever possible. SLiMs are short regions of proteins that mediate interactions with other proteins. A major focus of the lab is the computational prediction of SLiMs from protein sequences. This research originated with Rich’s postdoctoral research, during which he developed a sequence analysis methods for the rational design of biologically active short peptides. He subsequently developed SLiMDisc, one of the first algorithms for successfully predicting novel SLiMs from sequence data - and coined the term “SLiM” into the bargain. This subsequently lead to the development of SLiMFinder, the first SLiM prediction algorithm able to estimate the statistical significance of motif predictions. SLiMFinder greatly increased the reliability of predictions. SLiMFinder has since spawned a number of motif discovery tools and webservers and is still arguably the most successful SLiM prediction tool on benchmarking data. Previous work in the lab has focused on the evolution of functional specificity following gene duplication. Since moving to UNSW, activities have shifted more towards the use of PacBio long read sequencing and other cutting-edge sequencing technologies, working closely with the Ramaciotti Centre for Genomics. We are collaborating with industrial and academic partners to de novo sequence, assemble, annotate and interrogate the genomes of a selection of microbes with interesting metabolic abilities. Most notably, we have an ARC Linkage Grant with Microbiogen Pty Ltd. to understand how a strain of Saccharomyces cerevisiae has evolved to efficiently use xylose as a sole carbon source: something vital for second generation biofuel production that wild yeast cannot do. This project combines detailed molecular characterisation of highly adapted yeast strains with “molecular palaeontology” to trace the evolutionary process and identify functionally significant loci under selection. Following our experiences with de novo whole genome assembly in yeast, the lab is getting involved in an increasing number of genome sequencing projects. The biggest of these is leading the bioinformatics and assembly effort in a consortium to sequence the cane toad genome. The lab is also leading the BABS Genome project to sequence iconic Australian species for use in teaching and public engagement.